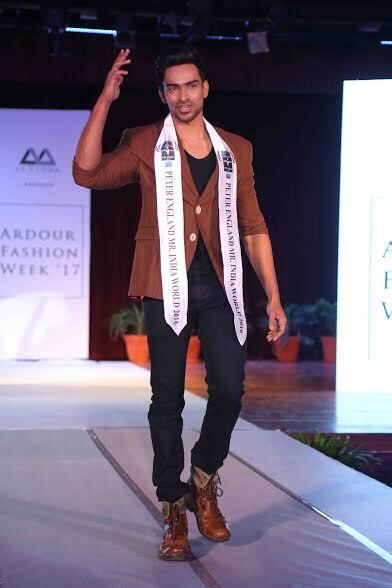 Jalandhar: Student organization ‘Altiora’ at Lovely Professional University (LPU) organized three-day ‘Ardour Fashion Week 2017’ for National Model and Designer Hunt at LPU campus, where First Indian to win ‘Mr World’ Title Rohit Khandelwal forwarded Modelling & Designing Tips to LPU Students. On this occasion 14 ace international and national models, designers & fashion bloggers, including Mr Khandelwal, Glamanand Super Model Akanksha Dhiman, Mr India World 2016 Vishnu Raj Menon, judged 300+ participants from across India. Under unanimous decision of them, Mr & Miss of the show were declared, both of whom were awarded with cash prizes worth Rs One Lakh. The stage was set to feature new collections of casuals, formal wears, trend-setters and more. The show showcased creation of emerging designers from LPU School of Fashion Technology and other brands’ designs prevalent in the vogue. Over 150 ensembles, inventively crafted by the participating designers, were judged by top national designers including Mrs Sonu Gandhi, Dhruv Bandwal, Farzana, and Siddarth K Kakkar. Showstoppers of the show remained Glamanand Super Model Akanksha Dhiman, Mr India World 2016 Vishnu Raj Menon, Miss Asia Pacific World India Anukriti Gusain, Miss Tourism International India 2016 Natasha Singh Chauhan, MTV Actress Bebo Memon, and Mr Dellywood 2016 Paramvir Cheema. International Ace Choreographer Shie Lobo (MTV fame) had choreographed the show. Mumbai based famous fashion models & bloggers Malvika Billa and Ayushi Dhamija covered the enchanting details of the show.